Species seen: United States and Canada, 775: Ohio, 289. According to the Fifth Edition of the ABA Checklist, Curlew Sandpiper and McKay's Bunting were the only "easy" (Difficulty Levels 1 - 3) birds I had not seen. The Sixth Edition revised the Difficulty Levels which led to the bizarre situation of a field birder organization presenting information useless to field birders. I dropped my membership in the ABA in protest. This page presents a thorough discussion of my position. I had hoped that the Seventh Edition would correct this but it didn't. It did, however, add quite a few species that were splits or new to the area, so I am using it. Thus, according to the Seventh Edition of the ABA Checklist (v7.9.0, 7/12/16, 993 species) there are eight birds reasonably possible for me: Cackling Goose, Sagebrush Sparrow, Egyptian Goose, Gunnison Sage-Grouse, Purple Swamphen, Rosy-faced Lovebird, Nanday Parakeet, and Scaly-breasted Munia. Although there are several more theoretically possible, they are either too irregular or too remote or would require a speculative pelagic trip for me to attempt. Some of the sagas of searches for life birds can be found on the Field Trip Reports page. Those through 2000 were submitted to the BirdChat mail-list whose members were extremely helpful in giving good advice on when and where to find my Nemesis Birds. For a couple of samples, try the good news/bad news 1996 trip to Nova Scotia and Billie's Excellent Alligator Adventure in the 1998 Florida trip. 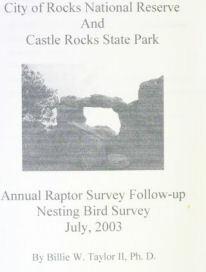 Our summer project in 2003 was to volunteer at City Of Rocks National Reserve. Beth worked in the office and I did a breeding bird survey. I delight in guiding visiting birders to local hotspots in Southwestern Ohio when I am not traveling to other areas for new adventures in birding. Contact me!